Although our Dinner in White has come and gone, this salad endures. And no, by that I don’t mean that I have week-old leftovers in my fridge. (I mean, I might, but let’s not speak of that.) I mean that I already had to make this salad again, and I am looking forward to having it on our table often throughout the winter. Along with that smoky cauliflower frittata, of course, and the cheddar and dijon cauliflower soup and that whole roasted cauliflower and…I might almost be looking forward to fall. Unlike most of the recipes I post here, let me warn you, this one takes an hour. An hour! But it’s mostly hands-off time in the oven, and it’s worth it. The cauliflower emerges limp and tender, the chickpeas crisp-edged and meaty. The pine nuts add crunch and the raisins sweetness and the whole thing will leave you actually happy that it’s cool enough to turn your oven on for an hour. We most recently ate this dish with a grated carrot salad, baked orzo with tomatoes, and a piece of grilled fish. It was certainly a feast befitting the harvest season. Roasted Cauliflower and Chickpea Salad: Cut a head of cauliflower into florets (save those leaves for cauliflower chips! ), toss with olive oil and salt, and roast at 400 until the cauliflower begins to brown, about 20 mins. Add 2 c. drained canned or cooked chickpeas with another pinch of salt and continue to roast for 20 more minutes. Add a big handful or two of pine nuts and roast 20 final minutes, adding a few handfuls of golden (or not golden) raisins for the last 5 minutes in the oven. Add a big handful of parsley plus a drizzle of good olive oil and additional salt to taste. Toss well before serving warm or at room temperature. This entry was posted in Beans and Other Legumes, Emmy Cooks Original, Food, Recipes, Salads, Vegan or Would-Be-Just-As-Good-Vegan, Vegetables By Themselves and tagged Cauliflower, chickpeas, CSA recipes, garbanzo beans, salad recipes on September 11, 2012 by emmycooks. 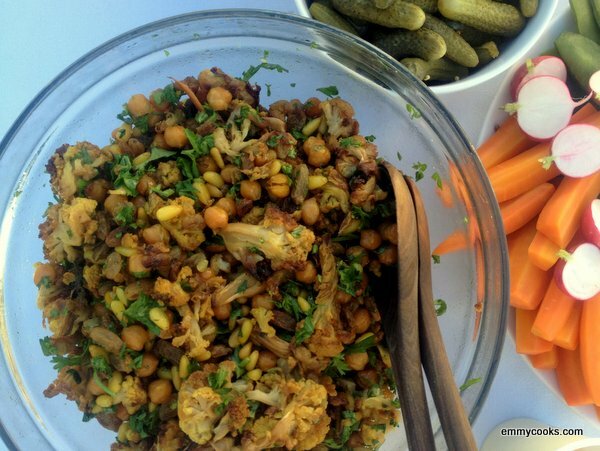 I like the idea of combining cauliflower and chickpeas! It’s so good! I like both the textures and the flavors together. That salad sounds like an ingredient match made in heaven! It’s totally going down in the kitchen soon! I noticed you started using WordAds, do you have any control over the type of content they advertise on your site? Oh thanks so much Emmy! I’ll email you if I have more questions! This salad speaks to me. The sweet bite of the raisins with the roasted veggies…mmmmm. Exactly. So good. I always love a sweet-and-savory flavor combination. YUMMMY! And how did I miss the cauliflower chips?! Thanks so much. I have some cauliflower growing, and I try to use the leaves, but was needing a new way to do it. I just made a version of this today – it was great! I didn’t have that many pinenuts in the house so I used a mix of walnuts and pinenuts. It worked really well.